Malossi has achieved the impossible, uniting the world of racing motors for scooters thanks to the RC-One Yamaha-Minarelli. Our technicians have designed the RC-One Yamaha-Minarelli as a platform for bringing together the technical solutions as well as the internal external dimensions with all RCOne Malossi models. The Malossi RC-One housings have been designed to be used only with 94cc Flanged Mount heating units with external studs. 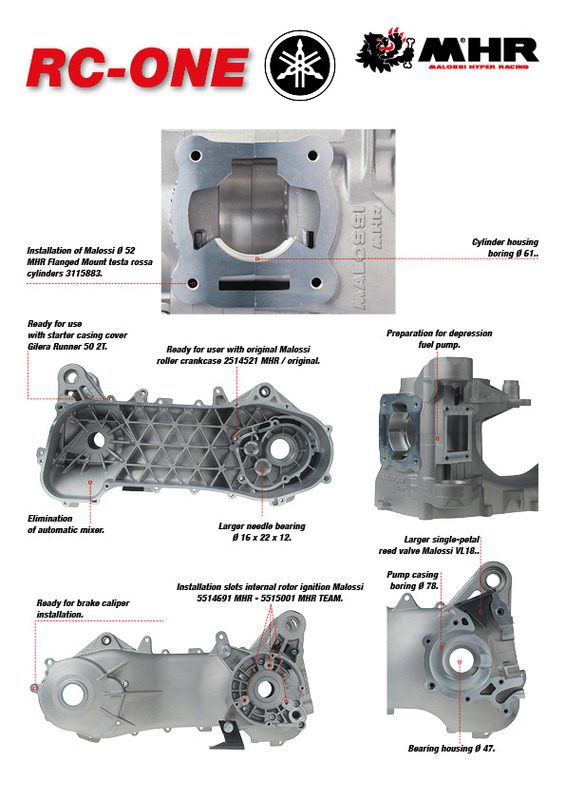 The generous pump housing dimensions are finally adequate enough for high capacity engine blocks. Malossi C-One uses the same transmission both for Piaggio and Yamaha/ Minarelli scooters, linking two worlds which have always been apart by enhancing and giving value to the best elements of both. RC-One for Yamaha has been designed to be entirely Plug & Play for all scooters equipped with 50cc Yamaha/Minarelli liquid-cooled motors: no modifications to the chassis are required, and the internal section can accept all products in the Malossi selection for the RC-One range, becoming a revolutionary solution for the development of racing components for ALL scooters. The base of the cylinder has been inclined by 10° compared to the original drive shaft axle - gears. This innovative development has allowed Malossi technicians to connect the motor attachments in front of the power unit, doing away with one of the biggest Achilles heels once of standard Yamaha/Minarelli motor housings once and for all. A modification underneath the saddle compartment. The base of the Yamaha RC-One has been designed to only house Malossi cylinders with flange mounts and external studs for the MHR Ø 52 Flanged Mount testa rossa family. The advantages of this solution open the door to the possibility of designing entirely unique cylinders. The reed valve mount has been significantly changed thanks to the latest 3D fluid dynamics simulation software, allowing Malossi technicians to find the ideal ratios and dimensions. The automatic mixer and mechanical water pump have been removed to reduce dispersion as much as possible. The possibility to perform a native install of a Malossi internal ignition rotor has been allowed. As for the bike itself, RC-One for Yamaha is designed exclusively for scooters with rear disc brakes fitted as standard, and is not designed for the alternative use of brake shoes. The interaxle spacing has been increased, with a consequential increased stability and precision when taking curves, whereas the gearbox housing has been reduced in size by overlapping the gear wheels. The increased interaxle spacing and the internal diameter means that the starter cover designed for Piaggio scooters is required. All RC-One for Yamaha housings are supplied complete with the components required for installation. Indeed, considering the notable technical differences when compared to standard units, Malossi has decided to include a reed valve, covers, and a special wheel pin in order to use the original rear wheel and make the RC-One perfectly interchangeable with Yamaha/Minarelli wheels and hubs. Another optional is the special rear mudguard to protect and keep the carburettor clean, now positioned at the rear. The new housings have been designed and built in Calderara di Reno at Malossi's new headquarters, one of the most advanced centres for research, development and production of special parts for motors and scooters. These parts were thought of and produced with one objective: to produce the most innovative racing components for scooters ever. 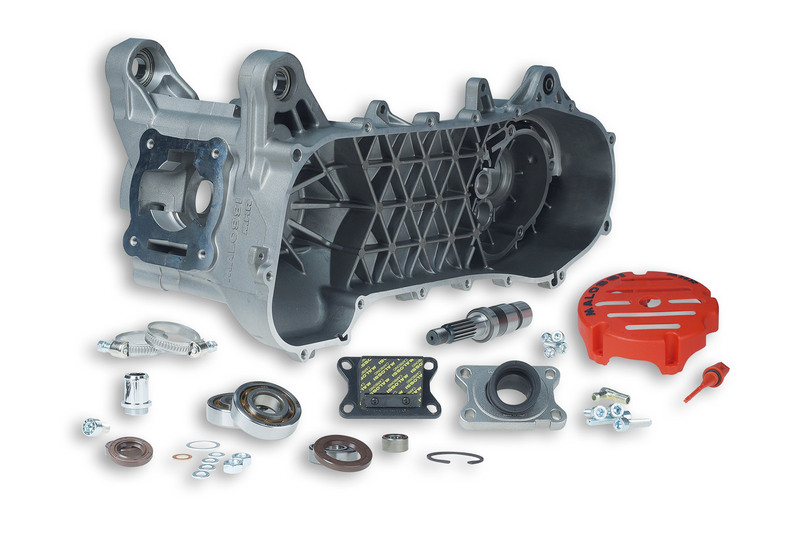 Crankcase pair, die-cast material in aluminum silicon alloy with high mechanical resistance. Crankcases inclusive of bearings 5.150 Kg. Crankshaft - clutch shaft wheelbase 270 mm. Crankshaft bearings 20 x 47 x 14. Oil seals FKM plus PTFE. Intake manifold X360 Ø 21 - 28 length 27. Cylinder stud bolts material: steel 8.8 UNI EN20898/1. Oversized cooling fluid connector: external Ø 18 mm - internal Ø 13,5 mm. Wheel axle bearing 20 x 47 x 14. Roller gear cover size 16 x 22 x 12.